Rounding out the unit-centric part of the Eldar codex review, we now turn to the units we haven’t covered yet: Wraith-type units and the Avatar. It is the former that a lot of fuss has been made about over the internet – but is this upset justified? Or is this reaction disproportionate to the actual threat represented by these units. Bring the D. The biggest change, which has been covered a bit in previous posts, is the change to the Distort rule. Continuing the theme of whoever wrote this codex really liking the fiction behind the Eldar, the weapons that tear a hole in reality to pull both souls and material into the warp have been universally re-written as Strength D weapons. It’s not that they do a lot of damage, or hit you with a lot of kinetic force – there’s simply a chance you cease to exist. From a fluff perspective, I rather like this as an idea – it very much plays into the idea that this is the twilight of the Eldar, and that they’re breaking out weapons that in a less dire age would be shunned as horrific. That they’re not going quietly into the darkness. But how does it impact gameplay? It very much depends on who you’re shooting. Consider the Wraithcannon as a stand-in for the S10 AP2 Distort guns in the previous edition which are now D AP2 weapons in the current codex. How much more dangerous did these guns actually get? The answer is it depends. 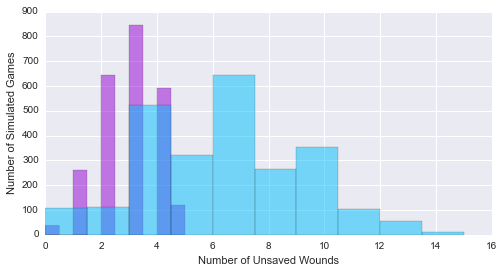 Lets look at some simulation results for 2,500 games, assuming 5 Wraithcannon shots (a standard size unit of Wraithguard) firing at a number of different targets. As always, you can follow along with the code here. Doesn’t really matter. With only one wound for each marine, the d3 or d6+6 wounds coming from Strength D doesn’t matter – both guns effectively kill a Marine on a 3+ followed by a 2+. Yikes. The most common outcome shifts from one dead monster to two. The old style guns were capped by the number of hits they could manage – at best, they could do 5 wounds. 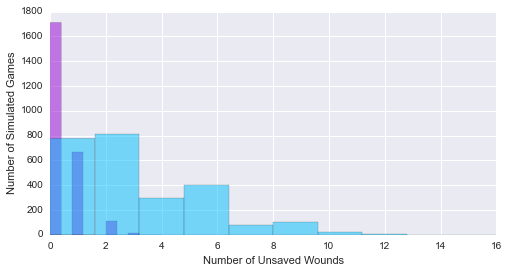 With Strength D, the ability to do d3 wounds means hitting monstrous creatures and other multi-wound models much more heavily. The vast majority of the time, a full squad of Strength D firing Wraithguard can kill the vehicle in question. Not surprisingly, this difference gets more pronounced the tougher the vehicle gets, as Strength D effectively ignores armor values. Either unit is dangerous to vehicles, but there’s basically no circumstance where it’s reasonable to prefer Strength 10. Wraithguard. The biggest change is what you’ve seen above – monstrous creatures and vehicles should now regard the fairly short-ranged Wraithguard as a threat to be avoided. Beyond this, they remain entirely unchanged. D-scythes may be taken as an upgrade, though you sacrifice some range in exchange for potentially more hits beneath a flame template, or with the d3 overwatch hits if you’re anticipating getting charged. Note that the D-scythe subtracts 1 from the Strength D result table, meaning it does nothing on a 1 or 2, and cannot get the “Rocks Fall, Everyone Dies, No Saves Allowed” result of a 6. While still tough, and mobile if they’re near a Spirit Seer, I think the Wraithguard have excellent cause to consider a Wave Serpent as their transport – it will definitely help them get into range faster and keep them protected from high strength, low AP weaponry. While they can walk across the table, I suspect D-phobia will mean they draw a lot of firepower. Like Dire Avengers, they’re less hurt by the Wave Serpent not being an assault transport – their role is to shoot, not to charge, so unloading, firing, and then possibly using Battle Focus to move backwards is a useful strategy. Conveniently, the Wave Serpent has enough room, with 5 Wraithguard, to also accommodate a Spirit Seer. The increased firepower of the Wave Serpent at short range may also be a useful way to address large units of cheap troops being positioned to interfere with your Wraithguard. Wraithblades. I suspect Wraithblades will be an aficionado’s unit in this codex, just with how good Wraithguard are at the moment. They slightly discounted (2 points) over their previous version, and their Wraithguard brethren, and they picked up Rage, which is nice given the fairly low number of attacks the Wraithblades have. They continue to be able to use Ghost Swords for S6 AP3 attacks, or trade in their pair of swords and lose an attack in exchange for S7 AP2 attacks along with a 4++ save. As they won’t be doing any shooting, it’s less important that they have a Spirit Seer babysitter along for the ride. Either one of those makes for a very tough close-combat unit, capable of making an absolute mess of Marine-type or Terminator-type units respectively. They’re definitely a solid choice if you’re looking for a close combat unit that’s less reliant on shattering a unit in a single blow, and more capable of getting stuck in and grinding things down. Like their brethren, they can take a Wave Serpent, but without being an assault transport, I think it’s of dubious utility. They can either advance relentlessly down the board on foot (possibly shielding more fragile units), or a squad of 5 fits inside a Dark Eldar raider, and their durability should protect them if or when the Raider bites the dust. Hemlock Wraithfighter. Another beautiful model that didn’t get much play last edition, it’s possible the Hemlock has come into its own. At 185 points, it remains the same price as it was, but it has gotten significantly better for the price. It’s guns are now a somewhat short-range (18″) pair of Strength D-1 Blast weapons, which as with the results for the D-scythe above will I think be considerably more useful than previous – Str 4 was not exactly an inspiring ground attack weapon. Especially, as mentioned, for attacking multi-wound models or vehicles, though as with previous versions it is utterly helpless against other aircraft. The Hemlock’s pilot has now gotten considerably better as well, roughly comparable to a Spirit Seer, at Mastery Level 2 and capable of taking Sanctic Demonology, Runes of Battle or Telepathy. Conceal in the Runes of Battle is potentially handy for keeping the flier alive, and the other powers work as essentially a mobile malediction platform, but honestly I’d take a long, hard look at Telepathy, as it’s maledictions are a bit better or at least comparable. This is especially true when you combine it with the Mindshock Pod, which puts enemy units within 12″ at -2 leadership when taking morale, pinning and fear tests. The amount of leadership-based hijinks this plane is capable of is insane. In terms of survivability, there’s the aforementioned psychic powers, and Spirit Stones that will allow you to ignore Crew Shaken on a 2+ and Stunned on a 4+. But you’re asking an AV10 all around flier to be acting in a close support role, getting quite close to the enemy to deliver its warp-rifty, psychically charged payload. That’s dangerous. Small arms fire can take it down, and any kind of dedicated AA will eat it for lunch. If you’re planning to get much done with the Hemlock, I’d consider units with Skyfire to be your top priority. Wraithlords. Existing in the awkward place between the infantry Wraithguard and the Wraithknight, the Wraithlord is essentially unchanged, save for its scatter laser weapon option getting cheaper. They’re tough, slow, dangerous monstrous creatures that can serve as either heavy weapons platforms, high strength melee units, or both. And having been on the receiving end of several of them, they’re quite formidable. If you liked them before, you’ll like them now. If you didn’t…there’s plenty else to take. Wraithknight. The heavyweight champion of a Wraith-based list, the Wraithknight was one of the premier units of the previous codex. Like many new units however, it had some oddities to it – taking both “small” weapon choices didn’t make any sense because they were unlikely to fire, and the visually spectacular sword unfortunately did very, very little for the combat prowess of the Wraithknight, making it a poor choice. Many of these oddities have been fixed – and in the process, the Wraithknight is an absolute beast. Getting 55 points more expensive, it’s now a Lord of War, and if anything, it’s a bargain at that cost. It is now a Jump Gargantuan Creature, befitting its considerable height, giving it Feel No Pain, greater resistance to poison, sniper weapons, Instant Death, etc. It’s twin heavy wraithcannons are long-range Strength D weapons, and if equipped with a Ghostglaive, it’s now Strength D in close combat, hitting at I5. As a mobile gun-platform, the twin heavy wraithcannons can potentially target and destroy two high value targets a turn. Alternately, the suncannon is a S6 AP2 Heavy 3 Blast weapon that comes with a 5++ invulnerable save shield as well, making the Wraithknight more durable and capable of murdering large numbers of high value infantry (where the 2 Strength D shots won’t get much work done). As a melee heavy-hitter, it also has a 5++ save and a master-crafted weapon, which will help mitigate those occasional disastrous rolls of 1 when you absolutely have to murderize everything. As Laser lock is no longer a thing, you’re free to choose any shoulder weapon you please, though my own inclination is toward the star cannons – if the Wraithknight is targeting something, it should be high value, at which point the better AP of the star cannon is worthwhile. With all these upgrades, it’s hard to regard the Wraithknight as anything other than an absolute beast, and very possibly cheaper than it should be. It will definitely draw fire, and is vulnerable to Strength D coming in return, or any sort of rending attack, but it should weather a great deal. Avatar of Khaine. The shard of a fallen War God, the Avatar is a formidable close combat opponent, with WS 10, 5 attacks and 5 wounds. Wailing Doom, his weapon, will put the hurt on anything he hits, and do it at the staggeringly high initiative of 10. He also buffs units around him, creating a 12″ bubble of Fearless, Furious Charge and Rage. There are however several issues – he’s restricted to being on foot, and while T6 and protected with a 3+/5++ save, it’s likely that he’ll take some fire coming in, and high volumes of fire can whittle him away. Restricted to being on foot, he’s relatively speedy given Fleet and Battle Focus, but depending on deployment it could be a very long walk before this monster gets into combat. He also competes for the lone Lord of War slot with the extremely good Wraithknight, and this does make him hard to take if your local group has banned Lords of War – a stance I clearly consider flawed. But if you are running a list built around foot-slogging assault Eldar, the Avatar makes a wonderful (and awesome looking) anchor, drawing fire from your other more fragile troops, keeping them from running, and hopefully tearing something apart when he does get into combat. And there we have it. 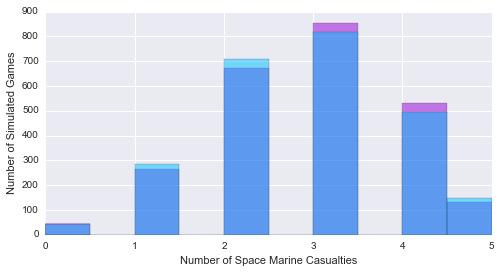 The end of the Eldar units, and we approach the end of this review series. Up next is a discussion of the new and pretty awesome Craftworld Eldar formations, and a holistic view of playing the Eldar as a faction. Very interesting in seeing hard math behind the analysis. Not that Wraithknight is a Gargantuan creature can I please get my Thanatars to also get that? So, for D weapons, the real advantage is the multiple possible hits, yes? Rather than an increased likelihood to damage. He means hits in the colloquial sense, actually meaning “Damage, be it wounds or hull point loss, to a target.” That’s been clarified a bit. By “they” I assume you mean Wraithknights, stomp is covered in “etc.” It is indeed an awesome ability, but I actually think some of the ones I mentioned are a bigger deal, especially in terms of keeping Wraithknights up. Well, on a 2-5 a d3 roll of 3 (same odds) will also take out a 3 hp vehicle, so I think really D still wins out vs vehicles any way you slice it. Not saying I think the panic is warranted, but just saying. 3 HP vehicles arent normally that impressive, IMO. What I think everyone is keying on is the D weapon’s abilities against superheavies and the step down from superheavies (LRs, Spartans, etc). In that case, wouldnt you possibly prefer the higher liklihood for taking the vehicle out in one shot (and getting it immediately off the table so it doesnt get another turn) rather than have to rely on plinking it? 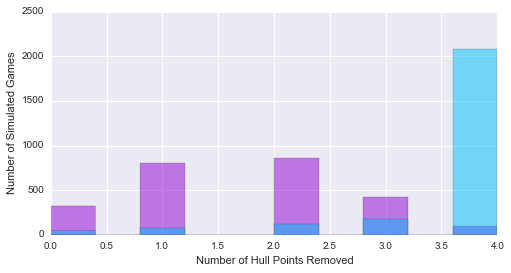 To answer your earlier question, no, it’s not adjusted for the results of penetrating hits, so some small number of those Str 10 results should have more destroyed hull points, though it’s not enough to change the answer meaningfully. To be honest, I didn’t bother because after coding armor pen, D, D-1, d3 hull points, d6+6 hull points, etc. the function was getting…cumbersome. I’ll improve it over time, but for now…as I said, there’s basically no way it will qualitatively change the answer. 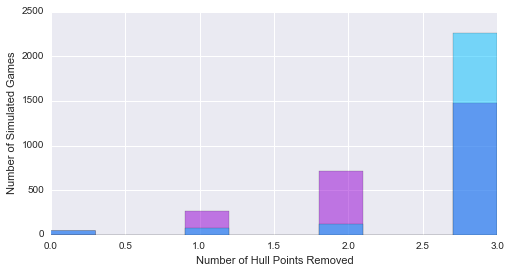 As for super-heavies, keep in mind an “Explodes!” result only does d3+1 Hull Points of damage. Contrast that with a 6 result on the D-table, which is also easier to get, and which will do d6+6. That effectively auto-murders Knights and light Eldar superheavies, and is a serious threat to totally removing Baneblades, Lord of Skulls, Revenant Titans, etc. So for the “one hit and its gone”, especially with a super-heavy, it’s better to be firing a D weapon. I think the use for high-strength weapons is that unless you’re going with a full-on Wrath army, there’s *still* not that much Ranged D in the game, and a lot of it is fairly short ranged. Normal S10 weapons scale really well against lighter armor, so can get tasked to dangerous but “light” vehicles that it feels like a waste to fire D weapons at. Or, as is the case with most of the Eldar high-strength weapons, have been firing for several turns before Wraithguard D-weapons are in range.